Posted by dutchgrub	on Wednesday, June 16, 2010 at 15:45. 9 Comments. As summer approaches and more and more visitors come to Amsterdam, the question about where to find the best rijsttafel in Amsterdam comes up frequently. I’m always torn as to what to recommend. On the one hand I understand the urge to try to typical local food. And for Amsterdam and the Netherlands the rijsttafel, originally imported from Indonesia, does top the list. On the other hand, I often walk away disappointed having been served what comes down to an exotic yet average buffet. Recently, Restaurant Blauw on Amstelveenseweg, has become my go to place for Indonesian and they do serve a good rijsttafel in a clean, modern setting. 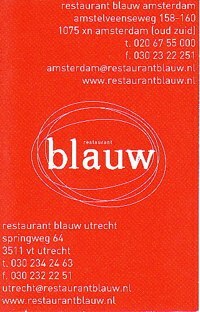 Blauw is located off the beaten path, on Amstelveenseweg, just off the far end of Vondelpark. Alongside other newcomers like Sophia, Umoja or Sucre it caters to a slightly hip crowd. It opened a few years ago as a branch of the popular Blauw in Utrecht. The interior is modern, dominated by black and red colors, and nicely split across three levels to make it feel smaller. While the ambiance is modern, the menu is traditional Indonesian. Next to the rijsttafel, Blauw serves Saté Ayam (chicken satay), Gado Gado (veggies with peanut sauce), Daging Rendang (slow cooked beef) and other Indonesian classics. Prices are not cheap – the rijsttafel for example is € 29,50 and wines start at € 20,= per bottle. Service, as unfortunately in many places in Amsterdam, can be on or off. sounds great! i’ll be in amsterdam with a few friends next week, and we look forward to trying it! do you recommend a rez for a tuesday night or does it not get that busy on weekdays? 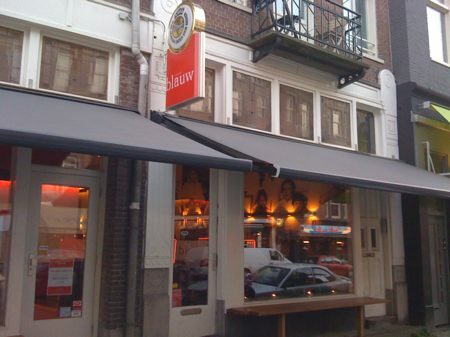 I definitely recommend a reservation – Blauw get quite busy, especially on school nights. Hope you enjoy the dinner! There’s a few nice bars in the area, like Gent or Bedier, if you want to hang out before / after. Flew into Amsterdam from New York on business and of course, rijsttafel for dinner was a must. The restaurant was recommended to me by my friends in Amsterdam. Ate there on Thursday night. Service was very good and the rijsttafel was awesome. Good vibe to the place. Which rijsttafel do you think is better in terms of both food and experience, Blauw or Tempo Doelo? And, is there a price difference between the two? We’ll be staying Canal Belt but don’t mind some traveling…I know Tempo Doelo would be closer to us. They are difficult to compare. Tempo Doeloe is very traditional and the choice of you are looking for authenticity. Blauw is a much more modern interpretation and better if you are looking for something different. I would say they are comparable price wise. Tempo Doeloe would likely be walking distance and Blauw is an easy tram ride. We are a group of 28 Americans who love food. We are celebrating my husband’s BIG birthday with a river cruise. We want to start off the week with a dinner for all on Sunday, April 24th. We are thinking about Blauw. Would you consider arranging the reservation for us and attending the meal, circulating and explaining to everyone about rijsstafel, arranging a less-spicy meal for the few who might need it, etc. You would eat with us and make it all smoother. Please let me know if this interests you and what the charge would be.